Whether you’re going out paddling somewhere with a cooler climate, like Ireland, or doing some winter kayaking, you can still enjoy your time out on the water despite the lower temperature. The important thing to remember is that you need to be dressed warmly enough that you don’t get too cold while you’re out there. You’ll soon discover that it feels quite a bit colder out on the water than it does on the shore, so you’ll probably need to dress a bit warmer than you realize. If this is your first time doing some cold weather paddling in the fall or winter, then let us give you a few tips on how to be best prepared with how to dress before you hit the water. Dressing for cold water paddling is both about keeping your warm when the air is cool and keeping you dry in the event that you end up in cold water. You definitely don’t want to get hypothermia, which is why it’s important to stay warm and dry out there. Below you’ll see your cold water paddling clothing options. And it is important to remember that you should always dress with the assumption that you’ll accidentally end up in the water swimming, because it can and will eventually happen to you when the water is frigid. The base layer is what you put on first and it should be something lightweight and moisture-wicking, which means no cotton. We even suggest something like Merino wool socks as a base layer with your surf booties. Your mid layer should be slightly warmer than your base, such as a fleece one-piece suit. And the shell is your outer barrier of protection. When the water is really cold, like in the winter, you’re going to want to have a base layer of insulation on when you go out paddling. If you’re going to be wearing a wetsuit, then a rash guard is a good option. Not only will it prevent chafing from the wetsuit, but it gives you a little extra insulation for warmth. Personally, I’m a big fan of Merino wool as a base layer since it is moisture wicking and comfortable to wear. For other insulation, you can look into Polartec® Power Stretch® fleece layers that you can wear under your drysuit or wetsuit. These good amount of warmth, plus they are soft against your skin. They’re also quick-drying, which is an important feature. You can actually wear these alone if it’s not too cold since they’re effective at blocking the wind from chilling you to the bone. The most common insulation to use with your dry suit is a full-length fleece liner. These tend to have front zip entries and really pair well with full dry suits. If you think that you might end up in the water, then a good wetsuit is a solid choice to make. While these are most commonly worn by divers and surfers, there are some good options out there for paddlers. You can find wetsuits made of either neoprene or polyurethane-coated fleece, with the former being the most common. The way that a wetsuit works is that it doesn’t actually keep out the water. Instead, it traps a very thin layer of water against your body and lets your body heat warm it right up. The benefit of this functionality is that you stay warm even when you’re out of the water. Depending on the weather, you may choose to wear what’s known as a “Farmer John” wetsuit, which is just a wetsuit that is sleeveless. Since it is cooler for the torso, this style, as well as the short-sleeve wetsuits, are popular when the weather is moderate but the water is not all that warm. Wetsuits are available in a variety of thickness levels, with the really thick ones really only be practical for divers. To narrow down your choices, stick with options in the 2mm or 3mm thickness range. One thing to keep in mind is that wetsuits are more practical for rough water paddle boarders and surfers than kayakers. 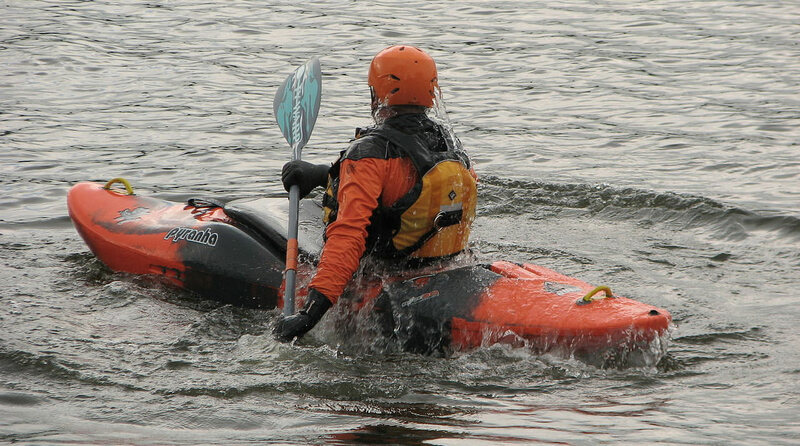 Most of the time kayakers stay too dry to make the wetsuits a comfortable and practical choice. If you’re interested in versatility for your cold weather gear, then you might want to create your own two-piece outfit. And you can pair a dry top with a Farmer John wetsuit or dry bibs. Dry tops have latex neck and wrist gaskets, with double-layered waist bands made of neoprene. It’s also common to protective neoprene cuffs on dry tops. Typically worn by boaters who want to prepare for unexpected trips into the water, dry bibs are for your lower half. They are cheap and pair well with dry tops. We don’t often see paddlers wearing these, but you can certainly wear them if that’s what you prefer. A step up from wetsuits in terms of protection, this option is ideal for paddlers who are going to be out in rough surf or rapids. They’re also ideal for rani downpours, so if you do a lot of paddling in Washington or Oregon in the fall and winter, this is a good choice for you. What distinguishes drysuits is that they are made of nylon that has a waterproof polyurethane coating (or waterproof/breathable Gore-Tex® laminate). The wrists, ankles, and neck have latex gaskets. And there is either a special zipper or roll-up closure that prevents any water from entering this one-piece suit. So if you tend up submersed in the cold water, you stay dry. They downside of drysuits is that they have zero insulation, so you can’t really just wear one by itself. Instead, you need to wear some insulation layers under it, like long underwear. One thing to note is that if you’re paddling in a location where it is hot outside but the water is cold, such as in the New England states during the summer, then you should wear a Gore-Tex® drysuit. This type of drysuit releases your body heat as you paddle, which prevents you from sweating inside the drysuit. It’s important that you don’t forget about your feet when you’re planning on how to stay dry and warm in the fall or winter. One great option is a pair of surf booties. These are designed to keep your feet warm when the water is cold. And they’re not just for surfers! You can even comfortably wear a pair of surf booties in the summer when the water is cool. Keep in mind that surf booties are made of neoprene and function just like wetsuits – your feet can get wet but the neoprene against your feet helps to warm the water so that your feet don’t get cold. Some other options to keep your feet dry when it is chilly are a pair of rubber boots or by wearing some Gore-Tex® socks inside your waterproof boots or water shoes. Obviously these options are only going to be practical kayaking or canoeing, and if you’re paddle boarding then we highly suggest wearing the surf booties. It’s easy to forget about your hands and your head when planning for cold water paddling, but you will certainly notice the chill if you forget to cover them! We’ve got a few suggestion to help you avoid freezing fingers and cold ears. In addition to helping protect against blisters, a good pair of paddling gloves can also help keep your hands warm when the air is chilly. You’ll want something that is water resistant, durable, and gives you a good grip on the paddle. Most paddling gloves are made of either neoprene, nylon or Lycra® spandex. If you think your hands are going to get wet, then definitely go with the neoprene. Otherwise, it doesn’t really matter. And if you’re paddle boarding on flat water, then you might be able to get away with just a good pair of mittens or gloves that have grippers on the palms. You can also find some paddlers pogies, which go over your hands and paddle to keep your hands protected while not compromising your grips. Honestly though, we think a good pair of paddling gloves is the best choice here. If you think that your head might get submersed under water, then you’ll want to wear a wetsuit hood for the protection against the cold. It works just like the wetsuit to keep you warm and is traditionally made of neoprene. If you don’t really expect to have your head in the warm, then just a warm fleece or woolen cap will suffice in keep your head warm while you paddle. By following our suggestions above, you can stay warm (and mostly dry) from head to toe the next time you take your kayak or paddle board out when the temperatures are cold.